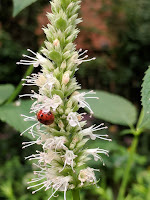 The Agastaches of North America are native mint family members related to the Eurasian hyssops. 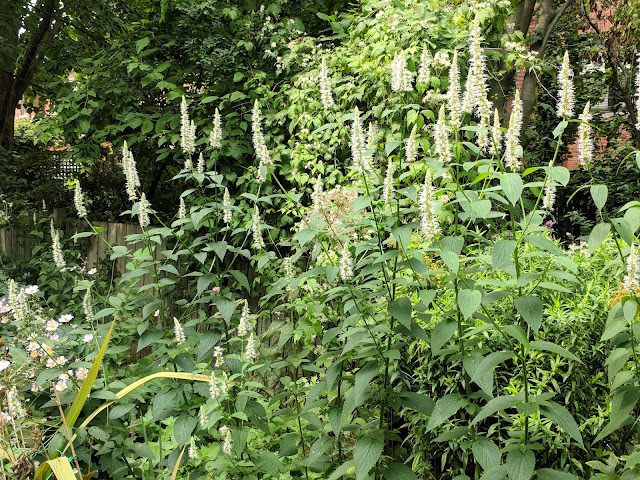 That's why the common names usually are things like "Anise Hyssop" - a blue flowering perennial whose leaves add a liquorice scent to teas. But today's flower is misleadingly called Purple Giant Hyssop. The flowers are almost always such a pale blue that they look white. 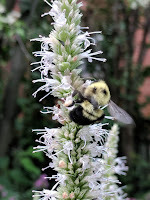 The Latin name is Agastache scrophularifolia, and it's native to much of eastern North America, zones 3-8. This is a tremendous perennial for pollinators, in more ways than one. 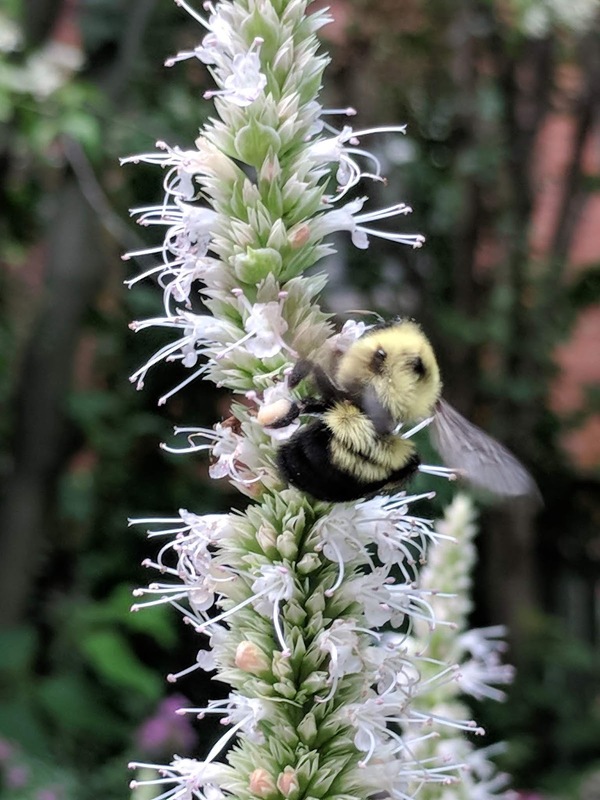 Flowers bloom over a long period in the second half of summer and into fall and attract a wide range of pollinators. The seeds are little nutlets which are intensely attractive to goldfinches, so in late summer I often see birds, bees and butterflies feeding at the same time. Tremendous in height, too - at 6 feet, this is a back of the border plant that needs full to half days sun, and soil that is not too dry. It's easy to grow from seed, blooming in the second year and onwards. The leaves don't have much flavor to me but can be used in teas. I love the candelabra shape of the branching stems. Unlike the true mints, Agastaches spread by seeds, not runners, so they won't take over your garden. There are beautifully colored Agastaches in the U.S. southwest and Mexico, which are being selected to produced fine garden flowers. Unfortunately, I'm not aware of any of these golden, orange, coral, red, or deep purple varieties that are hardy in the northeast. If you've found some that survive our winters, please let us know! Purple Giant Hyssop has become endangered in many U.S. states, due to loss of habitat and competition from non native species. 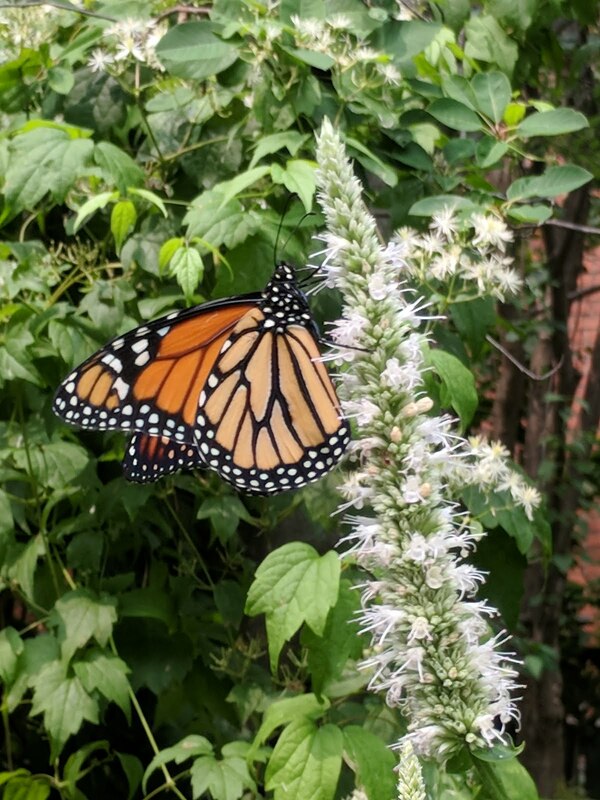 Consider putting some in your pollinator garden!